This is a very economical and basic unit but full of functionality. It is intended to fill a need for systems where the budget is tight and simplicity is key. For a more aesthetically pleasing unit with similar functionality, use the Single Fan Cooling Unit but it should also be said that economical does not mean cheap - this is a high quality blower specially manufactured to quietly and efficiently cool and last a long time. This unit has various uses but is most commonly simply placed on a component to provide direct cooling. With the mounting holes, it can also be fastened to a cabinet or using an optional gasket, can be adhered to the side of a component if space truly is non-existent. 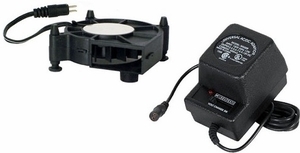 Uses the Included Variable Voltage Power Supply to Adjust Fan Speed. This allows the unit to be run more aggressively if installed in an enclosed cabinet or closet, or silently if necessary. Dimensions: 2 3/8" x 2 3/8" x H 5/8"